Since ICLA began developing relations with new friends on the Indian subcontinent we have heard some harrowing and heartwrenching stories of religious persecution. We see in the West how Islamists preaching hate are placated and indulged. It seems that a similar situation exists in India’s state of West Bengal. We were recently informed about the imprisonment of Hindu community activist Tapan Ghosh. His organisation, Hindu Samhati, reports (1) that he was arrested on 14 March 2013 on very tenuous grounds. Struggle for Hindu Existence reports that bail was not granted to Mr Ghosh and suggests that a policy of appeasement of Islamist violence is currently being implemented in West Bengal (2). It appears that Islamists are mounting an aggressive campaign against Hindus in both West Bengal and in neighbouring Bangladesh (East Bengal). It appears that there is a global trend towards appeasing Islamism across the world. Western support for Muslim Brotherhood type groups in North Africa and Syria is one example. The apparent willingness of Western countries to do the bidding of the anti-free speech Organisation of Islamic Cooperation (OIC) which has many member states that allow the persecution of religious minorities is another. We now see that such appeasement is not restricted to the Western world. The arrest and incarceration of Tapan Ghosh illustrates an organised global facilitation of sharia compliance. It seems clear to us that Tapan Ghosh is a political prisoner. Politically motivated arrests of anti-sharia activists is becoming a serious problem in many countries in the world. 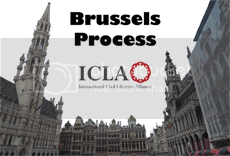 ICLA therefore belives that specific provision needs to be made in international law to formalise the right to oppose sharia. 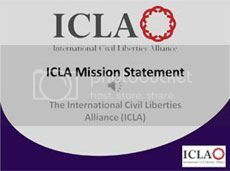 Item 8 of the ICLA Mission Statement makes this demand. We invite our friends in India as well as in countries across the world to join us in our campaign to formalise the right to oppose sharia into international law. The Islamic world needs to acknowledge that non-Muslims are not obliged to accept sharia compliance. Indeed the second class status that sharia law bestows upon non-Muslims provides moral justification for opposition to it.